Early to mid summer. Extended with deadheading. Classic in mixed beds. Complements just about everything. Good cut flower. Relatively easy but division every 2 to 3 years is a must. Prune after flowering to rejuvenate. This is the classic daisy with a yellow center and white petals. I consider them absolutely essential in the mixed border. They make a wonderful complement to blue-spiked flowers such as Veronica, Delphinium, Salvia, and Hyssop. The blossoms are 2 to 3 inches across and will persist from June through August if faded flowers are diligently removed. The plant is densely branched and reaches about 3 feet tall. Moist, fertile, well-drained soil is best. It will not tolerate soggy soil over the winter. Provide good air circulation and either full or part sun. Shasta Daisies must be divided about every other year. If this is not done, overcrowding will result in a loss of vigor and eventual death. Division is best done in the spring. Space new plants about 18 inches apart. 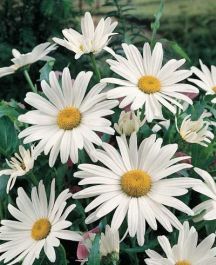 There are many new cultivars of Shasta Daisy - some less than a foot tall and some with all double flowers. I have found the more traditional "Alaska" to be the most dependable and trouble free. Blooms are generally single the first year with many doubles by the second year.